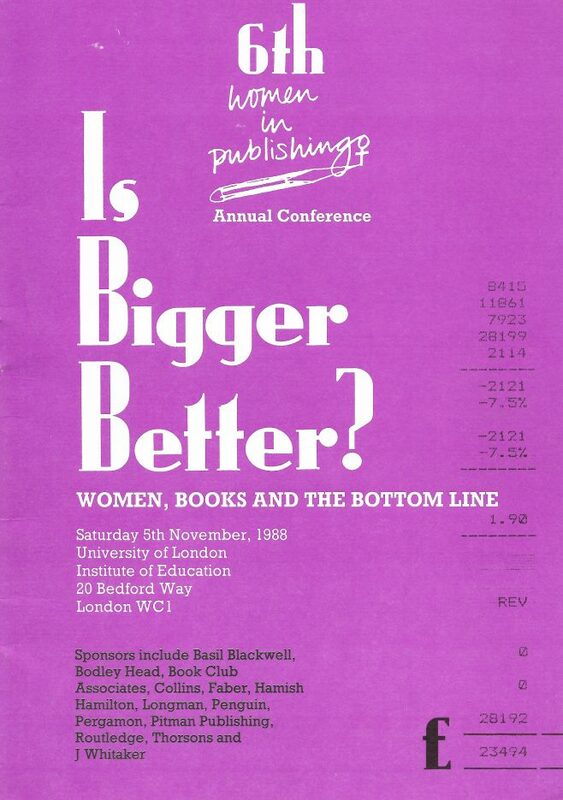 WiP organised six annual conferences at the University of London Institute of Education in the 1980s: ‘Publishing: A Gentleman’s Profession?’ (1983), ‘Take a Byte Out of the Apple, Eve! Women and New Technology’ (1984), ‘Famous Last Words? Women’s writing and the struggle to stay on the shelf’ (1985), ‘You Can’t Say That! Censorship and the freedom to publish’ (1986), ‘Big Girls Don’t Cry: Managing conflict in the workplace’ (1987), ‘Is Bigger Better? Women, Books and the Bottom Line’ (1988). They attracted hundreds of women over the years, high-profile speakers from the book business and beyond – Andrea Dworkin, Angela Carter, Helena Kennedy – and sponsorship from mainstream publishers.